In the 17th century, a naked-eye comet was tracked by several astronomers and referenced by Isaac Newton in Principia Mathematica (published in 1687 CE) as proof that, like planets, comets traveled in elliptical orbits and were affected by the gravitational pull of planets and the Sun. A few years later, Edmond Halley published A Synopsis of the Astronomy of Comets in 1705. In it, he included 24 comets that were visible to the naked eye between 1337 to 1698. Three, in 1531, 1607 and 1682, had similiar orbital paths. Halley believed they weren't three different comets, but the same comet orbiting the Sun. He preicted that it would return in 1759. 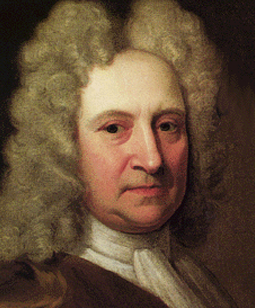 Halley died in 1742, so he didn’t live to see the return of his comet. However, the comet first became visible on Christmas Eve in 1758, in the constellation that Halley predicted. It became known as Halley’s Comet (1P/Halley). Halley's feat marked the first time in history that a comet returned as predicted. The second was Comet Encke (2P/Encke) in 1822. As of February 15, 2014, 296 comets have had their orbital period definitively determined. All 296 are inlcuded on this site as a list of periodic comets. What is the size of Halley's Comet? The dimensions of Halley's Comet's nucleus are 10 x 5 x 5 miles (16 x 8 x 8 kilometers). It is shaped like a peanut. Due to its size and speed, Halley’s Comet would cause a global cataclysm if it hit Earth. Four simultaneous points of view of the orbit of Halley's Comet (1P/Halley) from Jan 1, 1985 to Jan 1, 1988. Comet Halley reached perihelion on Feb 9, 1986. Click on icon in lower right corner to enter full screen HD mode. Credit: Osamu Ajiki. Modified by Ron Baalke (JPL). Adapted by Kevin Curran. Astrophysicists are uncertain when Halley's Comet first entered the inner solar system from the Kuiper Belt. It's first accepted, recorded observation was by Chinese astronomers on May 25, 240 BCE. There may be an older observation by Greek astronomers in 467 or 466 BCE. However, astrophysicists are uncertain if the comet in question was Halley's Comet. What is certain is that Halley's Comet has been a naked eye comet once every seventy-five to seventy-nine years since 240 BCE and that it's been recorded every time by Chinese astronomers. Since Halley's Comet enters the solar system at an 18° angle compared to the ecliptic, its orbital period is relatively erratic due to its occasional proximity to Saturn, Jupiter and other planets. The orbital path of Halley’s Comet is incredibly difficult to calculate retroactively due to close encounters with planets, inconsistent outgassing and a lack of precise observations centuries ago. However, the best astrophysicsts on our spinning, blue planet have taken shots. These calculations have allowed observations of comets in the past to be definitively linked to Halley's Comet. As astrophysicists wind the clock further back in time, the orbit becomes less and less predictable, especially when its orbit is perturbed due to a close pass to a moon or planet. If you'd like more information on how a comet gets its name, you can click on this link. Note: Please note, there is no year 0. So, for example, -239 refers to 240 BCE. Shih chi, a Chinese text written in 90 BCE, claims a "broom star" appeared in the east on May 25, 240 BCE. It then moved to the north. Although, the text is vague, astrophysicists have rewound the clock on Halley's Comet and determined that it would have reached perihelion somewhere around this time. It would have first been visible in the east, before moving north. If true, Shih chi represents the first known record of Halley's Comet. One of the most famous' appearances of Halley's Comet was in 1066 CE before the Battle of Hastings. William of Jumièges wrote in Gesta Normannorum Ducum ("Deeds of the Norman Dukes") in 1070-1071, "At that time a star appeared in the north-west, its three-forked tail stretched far into the southern sky remaining visible for fifteen days; and it was portended, as many said, a change in some kingdom." That change came to pass, and prince William claimed the throne—as the first Viking-blooded King to sit on the throne of England. This pebble-in-the-pond historical event is why Prince William is known, today, as the Duke of Normandy, after the town in northern France where his Viking ancestors settled and eventually came to rule England. There are two meteor showers associated with Halley's Comet (1P/Halley). They are the Eta Aquariids and the Orionids, which, respectively, peak in April and October. The last perihelion occurred on February 9, 1986. Halley’s Comet next perihelion wiill be on July 28, 2061. Halley's Comet's aphelion occurs in the Kuiper Belt. Halley's Comet's highly elliptical orbit occurs has been clocked at 157,838 miles (254,016 km) per hour, making it one of the fastest and most awe-inspiring naked-eye comets in the night sky. The comet is thought to have entered the inner solar system thousands of years ago for the first time and, like a nightmare house-guest, hasn't left since. What is Halley's Comet made of? 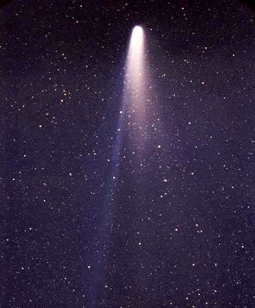 Halleys' Comet (1P/Halley) on March 8, 1986. For millennia our ancestors wondered about the nature of Halley's Comet? What was this bright "hairy star" speeding through the sky? Where did it come from? What chemicals was Comet Halley made of? A European Space Agency spacecraft, named Giotto, was launched on July 2, 1985. Its mission was to study Halley's Comet. Soviet / French spacecrafts (Vega 1 and Vega 2) and two Japanese spacecraft (Sakigake and Suisei) were also sent to study the comet. All together, they were affectionately named the "Halley Armada". Giotto passed closest to the nucleus of Halley's Comet, at 596 km, on March 14, 1986. Eight days earlier, Vega flew within 8,889 km of the comet's nucleus and sent back the first images. Giotto found that the surface of Halley's Comet reflected only 4% of the sunlight, which meant it was almost pitch black. It's brilliance to observers on Earth is simply an illusion, created by sunlight reflecting off the shed material. The surface temperature ranged from 170 K (−103 °C) to 220 K (−53 °C). It is composed mostly of non-volatile materials.